A new collection is always an excuse to celebrate. And this one even more so, as it’s inspired and named by the city where Circle Furniture began. The Cambridge Collection is exclusive to Circle Furniture and is a modern collection of timeless styles at a great price point. As someone with a newfound love for mid-century modern furniture and an affinity for jewel tones, this collection speaks to my design aesthetic. We’re excited to introduce you to every piece in the Cambridge Collection, but first, let’s learn about the inspiration behind the collection. The collection is similar to the furniture we offer in that it is designed to be highly customizable. These pieces will fit into your home decor whether you’re a lover of modern, clean lines, a traditional look, or somewhere in between. The designs are featured in rich colors that prove that neutrals aren’t always the way to go. The Porter, featured here in black leather, is a beautiful, classic tuxedo style sofa with clean lines. It’s featured in both metal and wood options, the wood base offering a more traditional look and the metal base a contemporary feel. The Porter is available in a sofa, sectional, an apartment sofa, a chair, and a matching ottoman. It’s customizable with multiple leather and fabric options. The Kendall is a tuxedo style sectional with a deep, comfortable seat. It has numerous fabric options and is offered at a great price point. It’s available with multiple leg options depending on the style you’re going for: wood, matte steel, or brushed brass. It’s also available in a sofa and a chair. The Beacon is a beautiful contemporary chair with soft lines and swooped arm. It has an attached back cushion for easy maintenance, no pillow fluffing required! It’s available in multiple wood finishes, and fabric or leather options. The Brattle is a multi-purpose sofa that comes in a sleeper, a sleeper sectional, a sofa, and a chaise sectional with multiple configurations. It’s a great option for a home office, guest room, or anywhere you need to save space. The Charlie Ottoman, featured here in hair on hide leather, is a versatile ottoman that can also be used as a coffee table, or as additional seating when you have guests. It has wheels for easy mobility. The Davis is a modern sofa, featured here in rich indigo velvet. “It’s visually stunning,” Heather explains, “Plus customers have been loving the comfort of the sofa.” It comes in a variety of rich jewel tones and neutrals, like magenta, tangerine, and moss. The Inman Chair is an edgy, contemporary option, featured here in Wilder Mink. It’s available in leather and fabric options and has a modern, clean look with a twist. It’s available in a brushed brass or matte steel finish, offering a beautiful contrast against the seat. The Harvard is available in a sofa, apartment sofa, sectional, chair, and matching ottoman or cocktail ottoman. It’s offered in beautiful rich tones in both leather and fabric. The Avon is a wood framed chair with a mid-century modern flair. It’s available in both a standard and a channeled style. It comes in a selection of stunning, rich-toned leathers and fabrics, and is featured here in Caribbean blue. It’s available in a settee, and a matching ottoman as well. The Avon chair is my favorite out of the collection. I love the texture of the channeled leather as well as the contrast of the simple design with the stunning modern colors. The Caribbean blue color is my favorite by far. It’s even more beautiful in person. The Concord sofa is a beautiful classic sofa, available in multiple size options as well as a chair and matching ottoman. It combines a classic, traditional feel with modern metal legs and beautiful contemporary colors. It’s featured here in blush pink but is also available in coral, zesty citrine, and neutral tones. The JB Swivel is a classic barrel swivel chair with a contemporary feel. It’s available in multiple fabric and leather options and comes as a swivel or swivel glide. The Putnam is a cozy sofa, available as a sectional, a chair and a half, and matching ottoman or storage ottoman. The sectional is perfect for curling up with family and comes in family-friendly performance fabrics. The Cambridge Collection is a versatile, stunning, modern selection of furniture and it’s only available at Circle Furniture. Come into a showroom near you to find inspiration and chat with a designer. 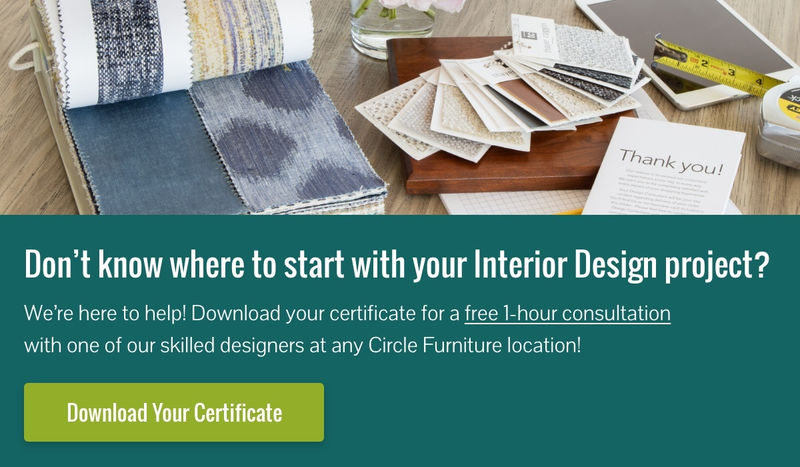 They can help you at every stage of the design journey, whether you’re redoing a living room or looking for that one piece to liven up your room. Read about how to add color, texture, and life to your home. Confused about color? Find the perfect color palette for you. Home Accessories: 8 Tips to Make Your Design Come to Life.